Gilbert and Sullivan’s search for Schubert’s Rosamunde: Good stories make good blogs. One of my favorites is about Gilbert and Sullivan’s discovery of the music for Schubert’s Rosamunde. Rosamunde, Fürstin von Zypern (Rosamunde, Princess of Cyprus) is a play by Helmina von Chézy. It is mainly remembered for the incidental music by Franz Schubert. The play premiered in Vienna’s Theater an der Wien on 20 December 1823. Gilbert and Sullivan had many quests. They had heard of Schubert’s Rosamunde which was lost. They traveled to Germany to find the music. There, they caught wind of a certain Doctor Snyder who may have been in possession of the score. The rest of the story reads like a cliff hanger. 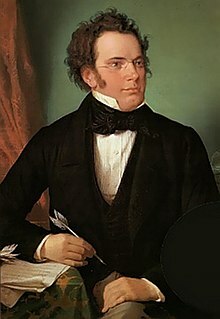 When they arrived at his home, Dr. Snyder told them he had had a number of Schubert’s manuscripts in his attic. Unfortunately, he placed them in the trash bin. The operetta duo ran to the trash. There, they not only discovered the score to Rosamunde, but numerous other symphonic works by Schubert. The rest of the story goes, they were so excited at the find, that they immediately played leap frog with each other. The famed writing team, Gilbert and Sullivan taking a bow onstage. I find this story quite significant to blog about. So many composers had had to have patrons or backers. It the baroque era, it was the Church. In the classical era, it was the nobility. In the romantic era, donors and backers were rich patrons. They helped composers to live and thrive not only for a day, but for decades. This is leading up to another upcoming blog: It will present the premise that without the support of musical creators by patrons, our concert halls will be without quality, vision or direction. The old names only serve us for so long. Only God is eternal. I personally have heard nothing but belittling comments and disapproval on my being a composer. “When are you going to make a living?” “Composing is fun. Life is hard work.” My question in return has always been. “Where does quality in life come from?”. Without the arts, life is short and brutish. I ask my public to please take an interest in something more than buildings. First, we must support the creators who give the musicians in the concert hall new music. After all, there might not be a Gilbert and Sullivan around at the right moment to save another poor Schubert-like composer.